Security forces in Burkina Faso have ended an operation against terrorists who attacked a Turkish cafe in the capital Ouagadougou Sunday that left 18 dead including two attackers, the communications minister Remis Dandjinou said Monday. In a press briefing he said searches of the neighborhood around the restaurant were still continuing. Dandjinou said there were several nationalities among the victims. Burkina Faso police and army forces patrol the steets on August 13, 2017 after gunmen attacked a cafe in the capital. The assault on the terrace of the Aziz Istanbul restaurant in the center of the West African city began around 9 p.m. local time Sunday (5 p.m. ET). The attackers barricaded themselves in the restaurant on Avenue Kwame Nkrumah in the center of the city, state media RTB reports, citing authorities. The operation by security forces ended at 5 a.m. (1 a.m. ET) Monday morning. Local media has reported that the restaurant, popular for its European cakes and pastries, was packed with people celebrating a birthday party. “I salute the bravery of our security and defense forces whose engagement allowed us to neutralize the terrorists,” the President Roch Marc Christian Kabore said in a statement. The Turkish Foreign Ministry confirmed in a statement that a Turkish citizen was among the victims. CNN affiliate BFM TV reported that one French citizen had been killed in the attack, but there was no immediate, official confirmation of this fatality. In a statement French President Emmanuel Macron praised the “effective mobilisation” of the Burkina Faso security forces and said he will discuss the situation with Kabore later Monday. France remains committed to pursuing the fight against terrorist groups in west Africa and accelerating work to set up a planned Sahel force to fight jihadists, the statement said. Burkina Faso — then known as Upper Volta — was a French colony until 1960. Macron visited the region in early July, when he said he wanted the force, which will initially count some 5,000 troops and begin its operations in Mali, Burkina Faso and Niger, to be operational by the end of August. After the attack, a security perimeter was established by the Defense and Security forces and all roads leading up to the Ouagadougou International Airport were closed. The injured were taken to the Yalgado Ouédraogo hospital center. Sunday’s attack echoes a similar one in 2016 on the Cappuccino Cafe in the same district of the city that left 29 dead. 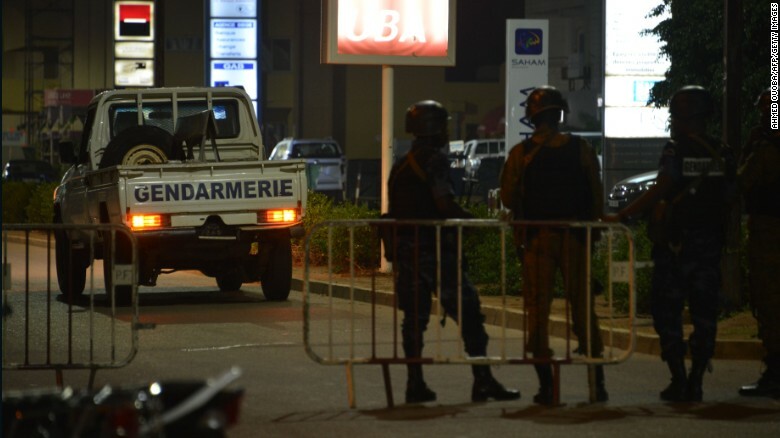 Responsibility for that attack was claimed by the jihadi group Al Qaeda in the Islamic Maghreb. Later that year jihadist attackers launched an assault on the Grand-Bassam beach resort in the Ivory Coast killing 16.